Home - Amigo! Communications and Consulting Inc.
A Lehigh Valley based solutions provider, systems integrator, and project management firm for small to large scale customers. ACI's core competencies center on our Program and Project Management Practice. Through our many business partners, we can help with the right tools for your needs. With Certified CCIEs & CCIAs, we stand ready to assist with your networking needs. Providing a metabolic approach for all your Technology and integration needs. Adhering to recommended Industry Standards insures your compliance and high quality implementations. Maintaining good policies and procedures with clear and accurate documentation is the key to minimizing cost. Contact us today to develop a strategic plan for your company or business. The mission of Amigo! Communications, Inc. is to provide products and services of the highest caliber for our customers; to demonstrate our commitment to the communities we serve; and to enhance the value of our services to our customers by partnering with established businesses to deliver high quality and reliable solutions; Our relationships with customers will reflect personal service that is distinctive of a local, community business, coupled with the broad range of affilations and technological proficiency of a large service bureau organization; Our unique capabilities and level of service will result in enhanced relationships with our customers and provide a framework for continued growth by business partnering and strategic planning; We will attract and motivate qualified business partners, capable of achieving our vision, and provide them with a rewarding and job-enriched environment. 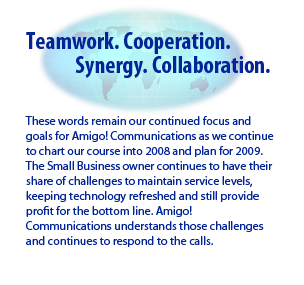 These words remain our continued focus and goals for Amigo! Communications as we continue to chart our course for the years to come. The Small Business owner continues to have their share of challenges to maintain service levels, keeping technology refreshed and still provide profit for the bottom line. Amigo! Communications understands those challenges and continues to respond to the calls. Welcome to our expanded world of technology integration in project management. As you can see, we have many areas of concentration and even more exciting things to share with our new potential clients. With so many technologies available to end-users and industry dictating timelines and business issues, successful integration will require timely and cost effective solutions. Only through developing strong business affiliations with the expertise in these varying areas of technology can the SMB (small to medium business) remain competitive and meet the business issues of our customers. Companies continue to downsize, rightsize, consolidate and do whatever it takes to make the bottom-line. This means past months represented lost wages to some, which is very unfortunate. In our opinion, keeping abreast with change means keeping current with technology while avoiding the "cutting to the bone" syndrome, which always results in losing good talent among the ranks.Systems Integration, Network Engineering and Data Communications are becoming more and more standard technologies and Amigo! Communications, though our business affiliates continue to remain up for the challenge. Diversity is the key to any successful endeavor. Our services are committed to our same service of excellence that we've prided ourselves on over the years. Through offering a diverse mix of services within the Amigo! business portfolio it is our continued goal to maintain all of our Amigos! as we continue to evolve our mission. The Gartner Group clealy outlines the need for external resources for technology procurement and the reasons why companies are doing so. With this, coupled with good leadership and great Amigos! on our team, I believe the most exciting times are yet to come.